Well established hotel for sale with great ROI just 1 block to Tamarindo beach. Titled land with a national park as your neighbor. Capacity 55, with a great pool, hot tub and swim up bar, restaurant that seats 40. 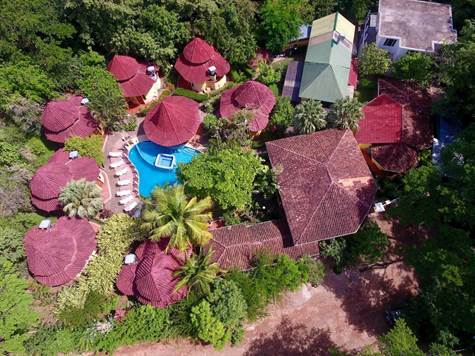 Includes 7 bungalows with loft for 4 pax, 7 standard rooms for up to 4 pax. Fully equipped and ready to go. Also included are 3 units that are rented and a separate 2 story home used by owner. Its one of the few hotels with all Tourism office (ICT ) approvals and sustainability certificate. Great Opportunity!